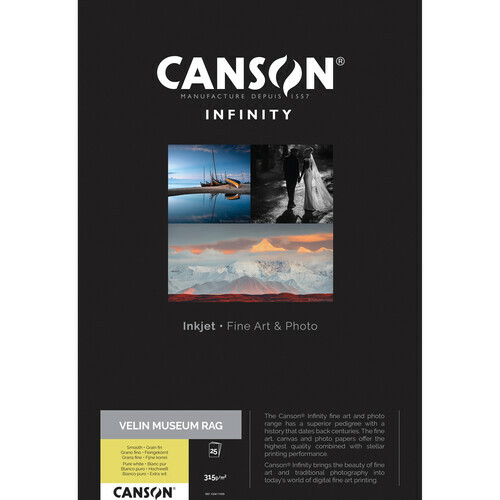 13 x 19" 8.5 x 11"
A fine-grained surface and structure chosen for lithographs, etchings, and more, Velin Museum Rag Paper from Canson Infinity brings velin into the digital age with inkjet receptive coatings and a pure white tone. Available here as a 25-pack of 8.5 x 11" sheets, this version of the mould-made 100% cotton rag paper features a basis weight of 315 gsm and measures 19.9 mil thick. It also uses no OBA content and reaches a whiteness of 83.35%. Additionally, it is acid free and internally buffered for longevity while it is instant drying and highly water resistant for durability and handling. Box Dimensions (LxWxH) 11.55 x 9.1 x 0.75"
Velin Museum Rag Paper (315 gsm, 8.5 x 11", 25 Sheets) is rated 5.0 out of 5 by 2. Rated 5 out of 5 by Cabbar from Sophisticated Look I printed Black & White prints on Epson R2400. I can say unequivocally that Arches Velin Museum Rag paper is just superb. I like its fine grained smooth surface. The paper has a natural white look without OBAs to degrade over time. I used the heavier 315gsm. and had no trouble loading and printing on the R2400. Since I used the images for fine art prints for sale, I was able to advertise the fact this paper was chosen to create lithographies, intaglio etchings, engravings and collotypes by world-renowned artists, and it is ideal for sophisticated photographs and museum-grade applications, as well as fine Art printmaking. Rated 5 out of 5 by Anonymous from Excellent for inkjet I originally bought this to try alternative printing processes (cyanotype in my case) and it was not useful for that purpose. But I decided to try some inkjet prints on my Canon Pixma Pro-100 and wow, the prints were stunning. The Canon had no problem loading the paper and the image retained fine detail. There is a hint of paper texture in the highlights (only very close examination of an 8x10 image), but I think it adds to the look of the prints. I did one with fine B&W detail and another with a range of colors and both really impressed me.